President Laurie reported on the Yagan Square meeting organised by the Rotary Club of Matilda Bay at which 9 of our members plus 2 partners attended. A Paul Harris Fellowship was presented to DR Richard Whalley at that meeting, the first to an indigenous person. Teachers came and went in those early years including a German who died in the classroom from a heart attack. Also, in Year 1 Bruce contracted rheumatic fever and had to be nursed at home by his mother for 6 months and in year 3 contracted hepatitis during the epidemic of that time. In his final year of primary school, he was made school captain. High school studies required him to travel for 2 hours to the nearest high school. After Matriculation Bruce returned to the farm for 3 years before returning to his studies at university in Canberra where he graduated with an honours degree that led to a teaching career in WA. During his farming career he helped to set up a Junior Farmers club in his area and attended a RYLA Camp sponsored by a local Rotary Club. President Laurie advised that the Club intended to send 4 students from Balga SHS and 2 Students from Shenton College to the RYPEN Camp. Advised that apologies must be notified on the web site. Rostered assistance with meeting setup is now published on the web site. 91 tickets have been sold and with only a month left for sales the 250 target is in doubt. Make sure that shares are enabled each time on Facebook. Further postcards are available for letter box drops. A club business card has been drafted. A joint meeting with the Rotary Club of Cambridge has been organised for Wednesday the 18th April at 7.00 a.m. at the Cambridge Bowling Club to see if a club merger could occur. 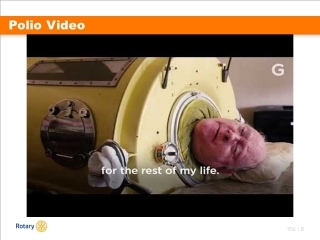 Jane showed a dramatic video featuring a Polio victim who spends most of his life in an old Iron Lung machine. 7th April is the final Speedway collection for the year. 10th April meeting of the Club is for Committee groups.